Can You Put a Glass Lid to CorningWare in an Oven? The Corning Glass company's ceramic CorningWare cookware, in its sleek French White incarnation or the familiar old-fashioned floral patterns, is a marvel of 20th century innovation. An offshoot of 1950s missile technology, the company's ceramic baking dishes are famously able to go from the freezer to the oven without cracking from the temperature change. The same can't be said for their glass lids, however. Although they are oven-safe, they require more careful handling. CorningWare glass lids can go from room temperature to the oven's heat, but the oven must first be preheated. If it's still warming up, the heat coming from your heating element or gas flame can be intense enough to potentially break the glass. The problem is called "thermal shock" -- part of your glass is trying to expand in the heat and the tension causes the glass to shatter. 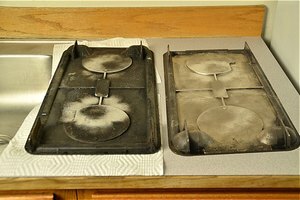 For the same reason, you shouldn't place an oven-temperature lid directly on a cool surface when your food comes out of the oven. The glass lids can't go from freezer to oven, like the dishes themselves. 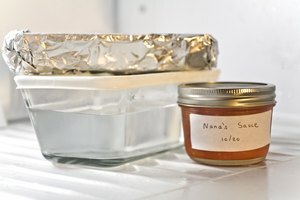 Instead, freeze your casseroles under foil or plastic wrap, and place the room-temperature lid on right before baking. The glass lids are more susceptible to breakage if they're chipped or scored from scouring with metal pads. These minute flaws, often invisible to the naked eye, can mean that a lid that's been safely used a hundred times might fly to pieces at the 101st use. Wash the lids by hand with a soft cloth, and use a nylon scouring pad rather than metal ones to remove stubbornly stuck-on food. Like other glass items, the lids will break if dropped. 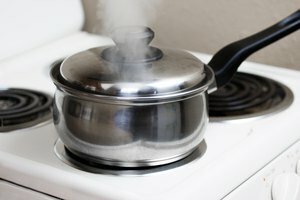 They stay hot for a long time after they come out of the oven, and absentmindedly handling one with your bare hand is a common cause of dropped -- and broken -- lids. 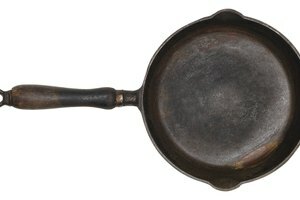 What Kind of Pans Are Needed to Cook in a Combination Microwave Convection Oven?